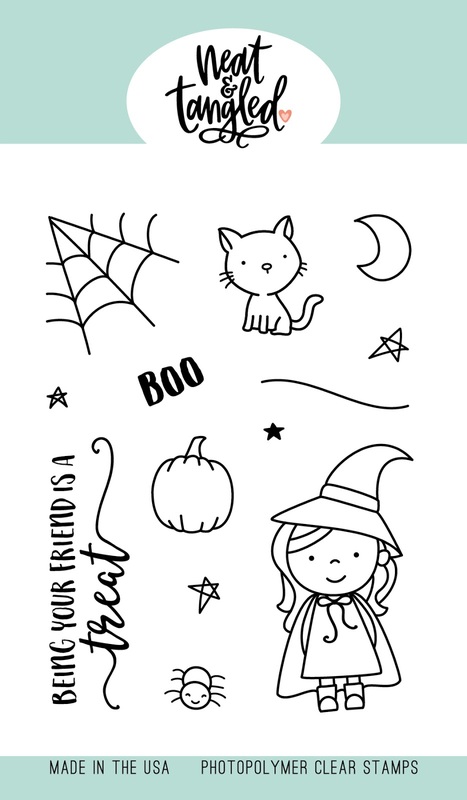 It features a cutie little witch, her little kitty and a few other not-too-spooky images. The sentiment is more sweet than scary too, which is how I like to do halloween! I colored the witch in orange and purple, and set her against a starry night sky. The kitty looks unsure, lol. 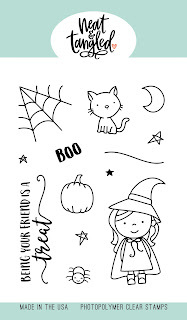 Instead of stamping a sentiment, I opted to die-cut BOO from the Journaling Alphas die set. And don't forget to leave me a comment before you leave - you could win a $25 store gift card, picked from among all of the blog comments for the week, and which will be announced on the Neat and Tangled blog tomorrow morning. Very cute scene. I like the kraft woodgrain framing. Wonderful card! I love the framing you used for your scene! Adorable witchy scene! Love the polka dot on your witch's dress. Congrats on the stamp set! It's absolutely adorable! I love the little Halloween scene you created! This kitty reminds me our next door neighbor cat ... she comes over every morning and just patiently sits like that, waiting for us to get up and let her on the porch. lol So cute, Elena. Wow! Another adorable set!!! Love it!!! oh my goodness she is adorable in her polka dot dress! I LOVE YOUR Black background! Makes the adorable witch really pop! Your card is so cute. Love the background "scene" and your awesome coloring. Cute card! I really love the frame wood look very cool! And your coloring is very awesome! I also love your back ground too! So cute! I love how you colored her and added the little dots! Little Miss Witch is simply adorable in her polka dotted dress. Yup, That's one scary Halloween card...NOT!!! Very sweet little witch in her polka dot dress and her cute little kitty. Very cute little sweet--great job! Adorable and beautiful stamp designs. Fantastic card! Perfect balance of light and dark and the craft wood grain cardstock shows off your focal image perfectly. So cute and sweet. I like your use of white. It stands out nicely against the other colors!